When Jesus was 12, He and his parents travelled to Jerusalem for Passover with a big group of their relatives. During this trip, Jesus was left behind. His parents found Him three days later teaching the elders in the Temple. Mary and Joseph were worried about Jesus, but He was exactly where He needed to be. Even at a young age, Jesus knew who He was and who His Father was and He was preparing Himself for His earthly ministry. Learning Aim: Jesus taught people in the Temple because He is God’s son. Water Bottle filled with rice, beads, pictures of Jesus, Mary and Joseph, the temple, a donkey, and a Bible to represent that Jesus is God’s son. Seal well. Before Class: Provide several small cars for the class. Provide cardboard to make roads (Or just use the classroom blocks). Say: Do you know that Jesus was a little kid once, just like you? The Bible doesn’t tell us much about when Jesus was a kid, but He probably liked to do the same things that you do. You like to play and Jesus probably did too. Today we are going to learn about a trip that Jesus and His parents took to Jerusalem. It was a long trip and Jesus family would have walked or ridden donkeys. While you play with these cars think about how it would have been different to travel like Jesus. What do you think Jesus would have been like as a child? 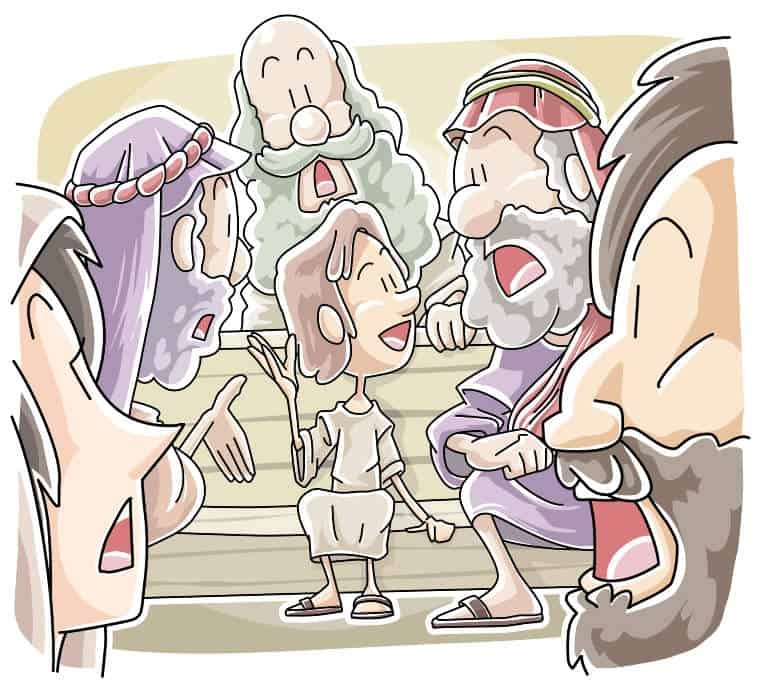 While the kids play, talk to them about how Jesus was the son of Mary and Joseph and the Son of God. You say the Italicized words. Non-italicized words are directions or answers to the questions. Show the picture of Jesus and His family traveling again. Each year Jesus and His family would travel to Jerusalem. Did they travel in cars like us? Allow for responses and remind them of the opening activity. No, they had to walk or ride donkeys. When the festival was over, Jesus’s parents left but Jesus stayed at the temple. His parents thought He was with some of their relatives so they travelled all day before realizing He wasn’t there. How do you think Mary and Joseph felt when Jesus was missing? Scared, annoyed, worried. They were probably very worried about Jesus. They hurried back to Jerusalem to find Him. It took them three days to find Jesus. When they found Him, He was in the temple teaching the teachers there. He understood more about God than anyone else. Mary and Joseph were relieved to find Him but also amazed to see Him teaching the teachers. Why do you think Jesus was able to teach the teachers? Because He is God’s son. He told Mary and Joseph that He needed to be in God’s house. Jesus is not only Mary and Joseph’s son. He is also God’s son and even when He was a child He knew that. Jesus came to save the world and that is why He stayed in the temple. Jesus went home with Mary and Joseph and was a good, obedient child. When you find Jesus, Say: Here He is. I am so glad we finally found Jesus. He was in the temple teaching the adults about God. Even though Jesus was a child, He was also God’s son and so He understood the ways of God better than anyone else. Before Class: Fill a clear plastic bottle with rice, and small beads. Put several small pictures in the bottle of Jesus, Mary and Joseph, the temple, a donkey, and a Bible to represent that Jesus is God’s son. Say: Mary and Joseph had to search for Jesus. In this bottle a picture of Jesus is hiding. Let’s see if we can find Jesus, Mary and Joseph, the temple, and the donkey. As they find each picture, talk about how that picture relates to the story. Before the Lesson: Write the numbers 1-12 on index cards. Hide one card somewhere in the room. Say: How old are you? In our story, Jesus was 12 years old. On these cards we have written the numbers 1-12 to show you have old Jesus was. Let’s work together to put them in order from 1-12. Put the numbers in order. Hopefully the kids will notice that a number is missing but if not draw their attention to it. Oh no, a number is missing, let’s see if we can find it. Once you find it finish putting the numbers in order. Let them show you how many years old they are on the cards. Say: Jesus was just a kid but He already was teaching people in the temple. Jesus knew that He was God’s son and that He had a big job to do. Draw the outline of a tree and write/draw your family on it. Say: Who is in your family? This is my family. Some people say that a family is like a tree. Your parents are the roots and you and your brothers and sisters are the branches. My family tree looks like this. Jesus’ family tree would have looked a little different because He had Mary and Joseph as His parent’s on Earth and also God as His true Father. Jesus is God’s son and He came to earth to save God’s people. That is why He was able to teach the adults in the temple. Help each child to draw the outline of a tree, then let them draw their own family on the tree. Teach the class a rhyme to help remember the lesson. Tony Kummer (Editor) reviewed & updated this page on : May 9, 2016 at 8:48 am. All our content is peer reviewed by our readers, simply leave a comment on any post suggest an update.